It's 2019 and the majority of these rights are still being violated all over the world. I remember learning about what it meant to be a bystander in elementary school. I remember adults telling me that if I saw someone being bullied, I needed to take action. I needed to stand up for the person being bullied and not be a bystander. This same lesson should be applied to cases where human rights are violated. In 1948, the United Nations met in Paris to determine the "Universal Declaration of Human Rights," essentially a list of rights that all humans should be entitled to have. This document was created by nations from all over the world and has been translated into over 500 languages, which makes it the most translated document in the world. It is supposed to serve as a way to create international law and order and ensure that people's rights aren't being violated. While reading this, I was surprised that some of the articles were in the document because I could think of many violations currently going on in the US and abroad. I'm sure that you're going to be surprised with some of these as well. You'd think that this would be a given, but even the United States is violating this basic right with everything that is going on at the US-Mexico border. There have been over around 8,000 families separated, children hit with tear gas, people unable to get proper medical attention, and cases where people have died. I think that this should speak for itself, yet there are millions of refugees all around the world who can't find a safe place to go. One of the more prominent problems is the Syrian refugee crisis, where over 13 million people have been displaced. Meanwhile, our President Trump doesn't even want to help these people, claiming that "they could be ISIS." "Everyone, without any discrimination, has the right to equal pay for equal work." The wage gap in the United States is real. The Institute for Women's Policy Research reported that "In 2017, female full-time, year-round workers made only 80.5 cents for every dollar earned by men, a gender wage gap of 20 percent." Free and equal. This declaration came out in 1948, but let's not forget about the segregation and Jim Crow laws that occurred in the United States during the mid-1900s. Martin Luther King Jr. wrote his "I have a dream" speech in 1963, which was 15 years after this declaration came out! "Everyone has the right to freedom of thought, conscience and religion"
There are still many countries around the world that try to limit and censor the information disseminated to their citizens and are against a certain religion. In China and Iran, there have been multiple cases where Christians have been detained or arrested. There are also plenty of authoritarian regimes, like North Korea, where people aren't allowed to express negative thoughts about the government. I suggest you read the full list of rights and contemplate how they are being violated in your community or around the world. There is no time to be a bystander when there are millions of people around the world who don't have these basic rights. The use of excessive force by law enforcement officers is derived from the lack of emphasis put on defensive tactics training, not racial motives. The use of excessive force by law enforcement officers has constantly bombarded the news and social media outlets in the recent years. Infamous cases of police brutality are constantly sweeping the nation. The cases of Eric Garner, Michael Brown, Ezell Ford, Tamir Rice, Antonio Martin, and Sureshbhai Patel are recent examples of perceived police brutality in America. In the majority of these cases, the suspect is African-American and the police officer is Caucasian. This coincidence of racial differences has led many people in America and around the world to speculate that the underlying cause of police brutality is racial discrimination and racism. However, the actual cause of police brutality is the lack of an effective defensive tactics training curriculum in law enforcement agencies. Police brutality has always been a relevant topic in my life. Growing up black in an economically disadvantaged area, or the "hood," relations with law enforcement officers have always been strained. The majority of black moms warn their kids to be careful of what they do in order to avoid confrontation with law enforcement officers. Most of the kids in the "hood" are being raised by their grandparents and that contributes to the bad relationships with law enforcement officers because the grandparents grew up in a time period where discrimination, segregation, and police brutality due to racial prejudice were rampant and an everyday social norm. African-Americans from the American Civil Rights Era of the 20th century spread the idealism that white law enforcement officers are racist and fear that their loved ones will become a victim of police brutality. The reality is that times have changed and while racism and prejudice still exist in America, not every law enforcement official is going to harm someone because of their race. That was a lesson I did not learn until after I moved out of the "hood," in a small town in Louisiana, to Houston, Texas. While living in Houston I was exposed to law enforcement officers in schools. My middle school had a white Houston ISD police officer and I was nervous every time I saw him. I tried my best to avoid him at all costs. One day I accidentally had an interaction with him, and he turned out to be one of the nicest people I have ever met. Ever since that day, my view of law enforcement officers has changed. The ideology that the "hood" instilled in me was instantly proven to be wrong. 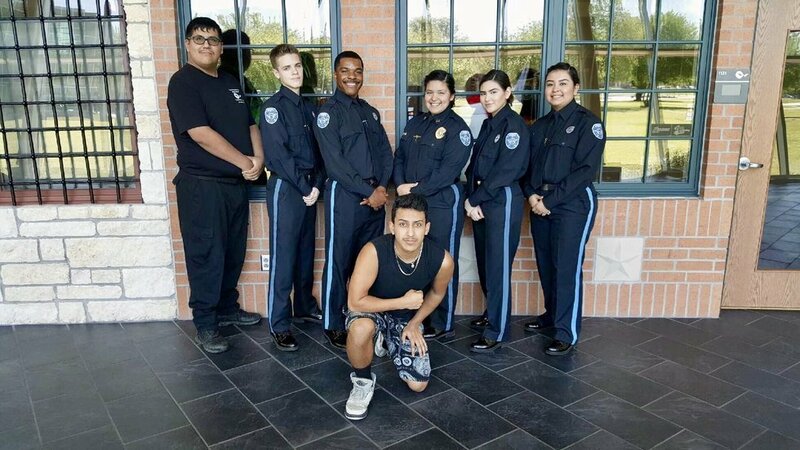 Being in the law enforcement pathway at Wunsche taught me that police officers are taught to be community-oriented, and it made me question the origin of police brutality in recent times. 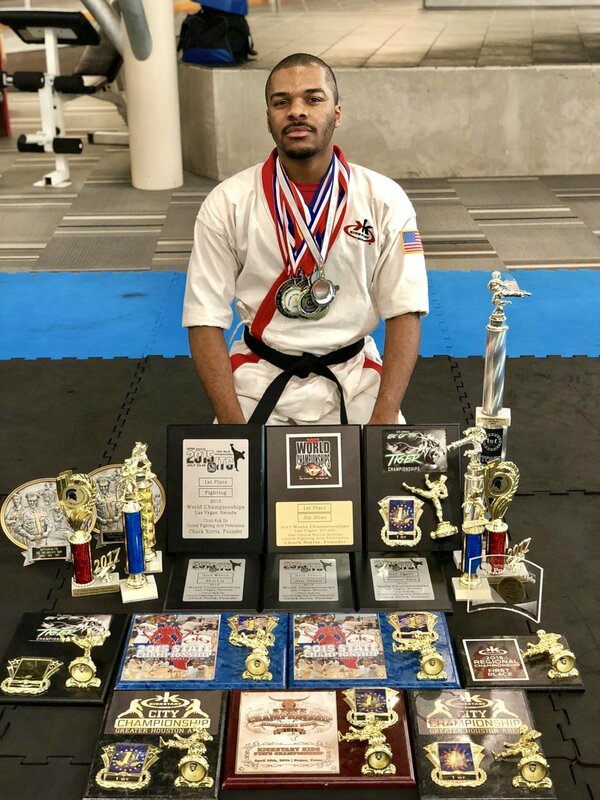 I was not satisfied with the amount of police brutality cases that were being broadcasted on the news, and I knew I wanted to be a part of the solution to combat police brutality in America. The lack of emphasis on defensive tactics training is a major problem that faces the law enforcement community. Police officers carry life-saving tools such as tasers, pepper spray, batons, and firearms. Officers have an increased reliance on their tools and their emphasis on hands-on defensive tactics techniques are decreased due to this over-reliance on their tools. As a result of the decrease in knowledge of hands-on skills, the police officers' fear of physically interacting with a suspect increases; therefore the chance of using excessive force and even the use of deadly force drastically rise. The growing number of excessive force cases cause police departments to create bad relationships within their communities. In 2010 the National Police Misconduct Statistical Reporting Project recorded 4,861 reports of police misconduct that involved 6,613 sworn law enforcement officers. Of the 6,613 officers involved in misconduct, 1,575 were involved in excessive force reports, which were the most prominent type of report at 23.8% of all reports. 897 of the excessive force cases involved were cases of physical use of force complaints which include fist strikes, throws, chokeholds, baton strikes, and other physical attacks. Two hundred and thirty two of the officers were involved in firearm-related excessive complaints, 166 were involved in taser-related cases, and the remaining other cases involved a combination of force types: use of police dogs, police vehicles, and chemical weapons such as tear gas. There have been credible allegations of excessive force that led to 127 deaths. 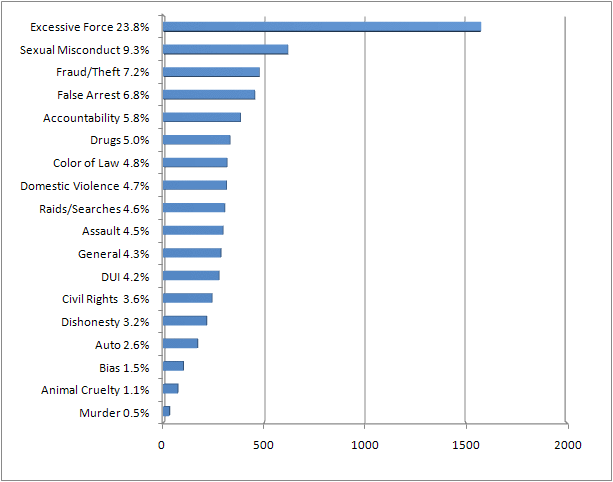 With excessive force cases being the most prominent, they will receive the most news coverage. In 2015 Cable News Network (CNN), revealed a video of a police officer, Michael Slager, shooting an unarmed man, Walter Scott, as he ran away from Slager after a traffic stop. Scott's death sparked renewed "Black Lives Matter" protests after the 50-year-old became the latest in a series of unarmed black men killed by police. The "Black Lives Matter" organization used the death of Scott to help promote their ideology that white cops are racist and America does not want blacks to succeed. After investigating, CNN authors Holly Yan, Khushbu Shah, and Emanuella Grinberg published a news article with the headline, "Ex-officer Michael Slager pleads guilty in shooting death of Walter Scott," where they stated that according to court documents, "Slager's first attempt to use his Taser did not stop Scott. The second deployment dropped Scott to the ground but he got up and took off running again. As he was fleeing, Slager shot him," (Yan). After reading the news article, I knew it was not a matter of racial issues but a matter of lack of training. When officer Slager first noticed that his taser was not effective he should have used another secondary option available. When Scott fled, Slager should have pursued him on foot and handled the situation hands-on instead of shooting Scott in the back. Slager shooting Scott in the back is an obvious sign of the lack of training received by Slager to handle a suspect who is unresponsive to a taser. Another example of a recent police brutality case that took the nation by storm was when Eric Garner died after being put in a chokehold by New York Police Department Officer Daniel Pantaleo. In 2014, Deborah Bloom and Jareen Imam of CNN posted, "New York man dies after chokehold by police," which displays a video of officer Pantaleo confronting Garner for allegedly selling cigarettes illegally. After minutes of verbal conversation, the officers tried to detain Garner but Garner refused and told the officers not to touch him. Seconds later Officer Pantaleo is shown choking Garner. During the video, Garner can be heard saying "I can't breathe! I can't breathe!" as he is being shoved onto the pavement by four other NYPD officers. The chokehold tactic is prohibited by the NYPD, therefore the officer should have never used that tactic to apprehend Garner. Secondly, immediately after the officer manipulated Garner into a prone position on the ground, he should have then released the chokehold and then secured Garner in handcuffs. Officer Pantaleo should have used a wrist manipulation technique or any other non-lethal restraint besides the rear naked choke because the rear naked choke immediately reduces the supply of oxygen to the brain by compressing the trachea and other vital organs to breathing effectively, and therefore causes the receiver of the rear naked choke to suffocate. Suffocation leads to unconsciousness and ultimately, if not released, brain damage or death, and that is what makes the rear naked choke a move that should only be used where the officer's life is in immediate danger. Officer Pantaleo's offense of excessive force is clear in the video and could have been prevented if he was properly trained in defensive tactics, on knowing the level of force necessary needed to apprehend a suspect, and knowing when to decrease the amount of forced used after a suspect is in a position where he can be safely detained. My method of combating the increasing number of excessive force cases is by increasing the amount of emphasis put on defensive combat training for law enforcement officers. 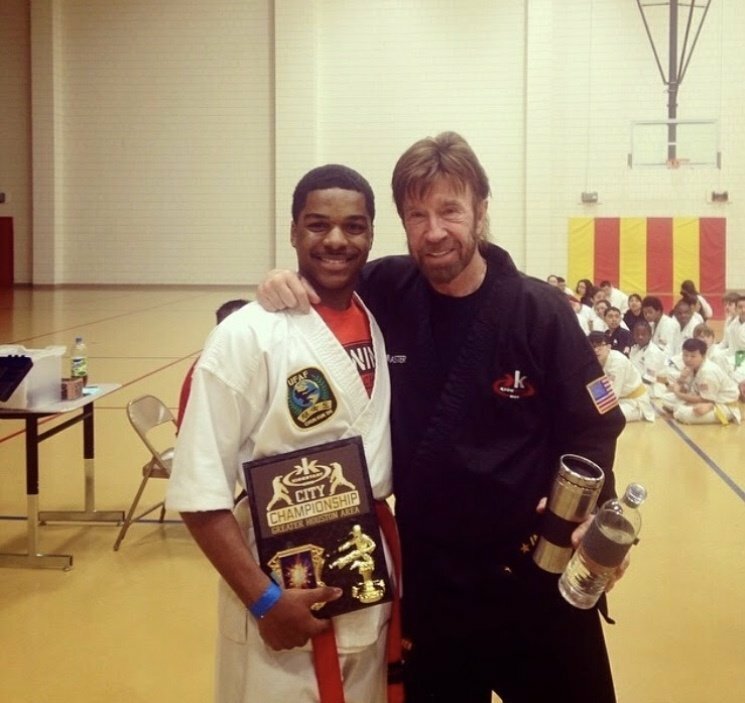 My extensive knowledge of martial arts from years of training under Chuck Norris and his program Kickstart Kids inspired my solution. My knowledge of the martial arts gives me the confidence necessary to act calm and rational in a physical altercation. I believe that if law enforcement officers had knowledge in various forms of martial arts that it will reduce the number of police brutality cases. As stated by Keith Underwood, former law enforcement officer, in my interview with him, "the amount of training it takes to be proficient at hand to hand combat is a lot…training is about clear consistent training and the consistency is the problem." My program would partner with the Gracie Jiu-Jitsu Academy by certifying instructors in the Gracie Survival Tactics (GST) Military/Law Enforcement Instructor Course. 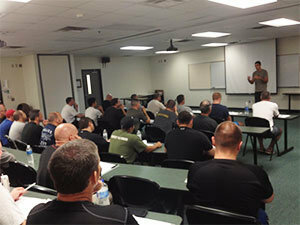 Ryron and Rener Gracie are the instructors training law enforcement officers to become instructors in the GST course. The Gracie brothers are martial art masters with extensive knowledge of Brazilian Jiu-Jitsu. In their Youtube video, "Las Vegas Police Officer Uses Jiu-Jitsu to Control Larger Suspect," Ryron and Rener Gracie demonstrate and elaborate on how proper knowledge in defensive tactics techniques give law enforcement officials the ability to control a suspect without having to resort to excessive force which may include deadly force. The Gracie brothers explain how deadly weapons are always available in law enforcement situations and if an officer does not have the resources to maintain control, the situation could turn deadly. Excessive force is due to the lack of training. An officer without options is an accident waiting to happen. If an officer does not have knowledge of intermediate force options or hands-on tactics, then an officer is more likely to use excessive force prematurely. The use of excessive force by law enforcement officers is derived from the lack of emphasis put on defensive tactics training, not racial motives. The only way to bring police brutality to a halt is to put a stronger emphasis on hand to hand fighting techniques. A federally funded program would ensure that officers are being trained effectively, responsibly and properly. Training our law enforcement officers will not only benefit the officers' knowledge in defensive tactics, but it will also help rebuild community relationships with law enforcement. The program will be the stepping stone to building a strong foundation for national unity with law enforcement officials. The strong relationship that can be built will help heal the wounds suffered in our nation and ensure prosperity for all.